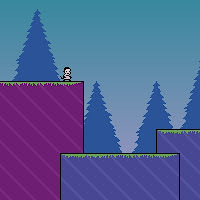 Knytt is the latest platformer by Nifflas, a developer who gained much fame after the release of Within a Deep Forest. The story begins with an abduction and a crash landing on some unfamiliar planet, which means plenty of land to explore although there's hardly any interaction with other creatures. Save points are easily accessible, Knytt will glow red when in danger, and the shining beam of light will assist your search for the necessary repair items. There's about sixty screens worth of adventure which equals to roughly an hour or two of play. Of course, This isn't a Nifflas production without several unlockables and secrets to reward the curious. A worthy tribute to Seiklus.